When using or talking about iTunes, iPhone, iPad or iPod Touch or other Apple products, you may have met some words like AAC, M4A, M4B, M4P or M4R. They seems to be familar and people always simply call them as iTunes audio formats or AAC files. Actually, Apple use them for different types of audio files and some formats come with DRM protection. 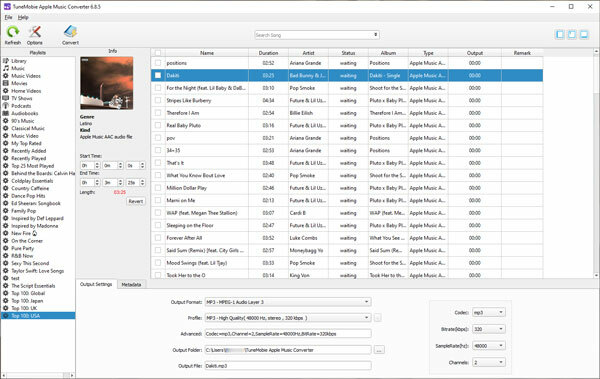 Apple Music Converter is the right software solution to help you handle all iTunes audio formats including removing DRM protection and audio format conversion. When talking about digtial audio, AAC is the abbreviation of Advanced Audio Coding. It is a proprietary audio coding standard for lossy digital audio compression. AAC is designed to be the successor of the MP3 format, and after the annoucement of MP3's death, AAC is replacing MP3 gradually. With same audio bitrate, audio quality of AAC is generally better than MP3. AAC is the default or standard audio format for YouTube, iPhone, iPad, NDS, Android mobile phones and tablets, Sony PSP, Walkman, PS3, PS4, etc. AAC is also supported by manufacturers of in-dash car audio systems. Generally speaking, AAC file we talk about in our daily life refers to unprotected AAC file which uses M4A (*.m4a) as file extension. And all iTunes audio formats including M4A, M4B, M4P and M4R are using AAC codec. Also, there are protected AAC audio format which mainly refers to M4P format. Besides, M4B audiobooks and iPhone M4R ringtones are also encoded in AAC audio codec. M4B could be either protected or unprotected depending on their source, and M4R is unprotected. So when talking about AAC file, it normally means the audio files in M4A, M4B, M4P file extension using AAC audio codec. Please note that there is also AAC (*.aac) file extension. However, *.aac files could neither be added to iTunes library, nor played on iPhone, iPad, Android or other mainstream phones, tablets and game consoles. M4A (*.m4a) files are mainly encoded in AAC audio codec. As AAC is lossy digital audio compression, thus M4A files in AAC codec are not lossless audio files. From March 2009, Apple has been selling music tracks in iTunes Store and the songs are 256kbps M4A files without any protection. M4A songs can be played on iPhone, iPad, iPod Nano/Shuffle/Touch, Andoird phones & tablets, Kindle Fire, Sony Walkman and many more devices like various MP3 players. M4A can be also used as ringtone of Android phones. Besides, you can add M4A file to various video editing software, DVD/BD authoring software as background music. M4A songs can be also burned to audio CD with iTunes. If you have purchased M4A songs or albums in iTunes Store and you delete the songs by mistake, you can always go back to iTunes Store to re-download again. Besides, M4A is also the file extension of Apple Lossless Audio Codec, or sometimes we call ALAC. ALAC is lossless digital audio compression, so audio quality of ALAC M4A will be much better than AAC M4A. Generally speaking, the M4A audio output in audio conversion software refers to M4A in AAC codec. M4A in ALAC codec is not so common in our daily life. In most cases, M4A files we talk about also refers to M4A files encoded in AAC codec. B in M4B (*.m4b) refers to book. M4B format is also encoded in AAC codec and similar to M4A, however, it mainly used as file format of audiobooks. Some websites provide free audiobooks in M4B format and there is no DRM protection. However, if you purchase audiobooks from iTunes Store, you will also get M4B audiobooks, but iTunes M4B audiobooks are DRM protected. Generally speaking, an M4A song is about 3 - 5 minutes, but an M4B audiobook could be from several hours to 100 hours or even more. There is no chapter information in a M4A song, however, there will be multiple chapters for an M4B audiobook, and chapter information help audiobook listeners easily to rewind to where they left last time. Unlike M4A, M4B is not widely supported even it's not protected ones. So if you want to listen to M4B audiobooks on all your devices, you need to convert them to MP3 or M4A first. 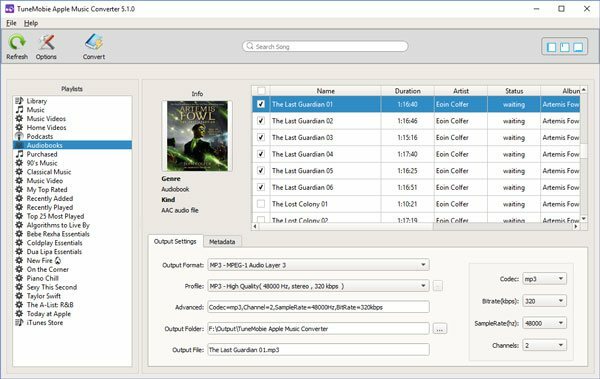 Many audio converters can convert unprotected M4B audiobooks, however, they can't deal with protected iTunes M4B audiobooks. If you want to remove DRM from iTunes M4B audiobooks and convert them to MP3 or M4A, Apple Music Converter could be a good choice. And when converting iTunes M4B audiobooks to M4A, chapter information can be kept in the output files. To remove DRM protection and convert iTunes M4B audiobooks to MP3 or M4A, launch Apple Music Converter first and iTunes will be automatically launched as well. iTunes library will be listed as playlists in the left panel of the program, click "Audiobooks" playlist and check the iTunes M4B audiobooks, choose MP3 or M4A in the output list, then click Convert button to start conversion. P in M4P (*.m4p) refers to protection. It indicates that M4P format is DRM-protected audio format. In different periods, M4P could be song format you purchased from iTunes Store before March 2009, or could be Apple Music song format after June 2015 when Apple Music service was started. Before March 2009, Apple sold DRM protected M4P songs in iTunes Store, and you need to purchase your favorite songs one by one or you can buy entire album instead. You can play M4P files on all iPhone and iPod models including iPod Nano/Shuffle/Classic, and it's not available for any non-apple devices. Such M4P songs could be burned to Audio CD, and then you can rip Audio CD and save as MP3 or M4A. In this way, you can convert protected M4P to MP3 or M4A easily. Apple stopped selling DRM-protected M4P songs and started to sell DRM-free M4A songs in March 2009. Everyone thought M4P would be disappear as the time flew by. However, M4P came back in June 2015 as Apple Music file format. Apple Music M4P format is also DRM-protected, however, there are some difference compared with the old M4P format. Apple Music is available on Windows, Mac, iPhone/iPad/iPod Touch, Apple TV & Android mobile phones, and it's not available for iPod Nano/Shuffle/Classic. Besides, Apple Music M4P can't be burned to audio CD. You only need to pay a monthly subscription fee to enjoy over 45 million songs. If you want to enjoy Apple Music M4P songs on any devices including iPod Nano/Shuffle/Classic, Android tablets, PSP, Sony Walkman and various MP3 players. You can also use Apple Music Converter, which we have mentioned in M4B section above, to convert Apple Music to MP3 or M4A with ID3 tags and 100% audio quality kept. To remove DRM protection from Apple Music M4P format, simply launch Apple Music Converter and iTunes will be launched as well. Then select Apple Music tracks which will be listed in either Music playlist or separated Apple Music playlists, choose MP3 or M4A as output format and click Convert button to start conversion. R in M4R (*.m4r) refers to ringtone. M4R is iPhone ringtone format and it's also encoded in AAC audio codec. There are many free programs or audio converters which can help you to convert video or audio files to iPhone M4R ringtone files. However, please note that the maximum duration of iPhone ringtone is 40 seconds. If you have got some M4A files, you can even change M4A file extension to M4R without conversion because there is nothing different except for the file extension. On Android mobile phones, M4A song can be set as ringtone directly and there is no duration limitation. However, Apple Music songs or M4A songs can't be set as ringtone on iPhone. For Apple Music songs, you can convert to M4A first, then trim the output M4A and rename to M4R. In iTunes 12.7, Apple removed ringtone management function, so if you want to transfer M4R from PC to iPhone, you can use free or paid iPhone transfer programs instead. Apple Music Converter can remove DRM protection Apple Music songs, iTunes M4B audiobooks and Audible AA/AAX audiobooks, convert Apple Music songs, audiobooks, iTunes M4A songs and other iTunes compatible audio formats like MP3, AIFF, WAV, etc. to MP3 and M4A with ID3 tags and metadata retained. Besides, Apple Music Converter can also extract audio from DRM-protected M4V movies, TV shows or music videos. Apple Music Converter is an all-in-one iTunes audio converter to help you deal with M4A, M4B and M4P as well as create M4R ringtones for your iPhone.